Latex can be found almost everywhere in healthcare settings. Latex is in virtually every clinic, hospital room, and surgical settings in the form of protective medical gloves, adhesive bandages, catheter tubing, infusion sets, and many other products and devices. At the same time, latex poses a threat to those who have an allergy to it. Latex allergy can range from a mild skin irritation to anaphylaxis and even death. Thus, it is important to try to prevent people from developing latex allergy and to help those with latex allergy from experiencing an allergic reaction. Natural rubber (polyisoprene) is a critical component in a wide array of products we use on a daily basis. Almost all natural rubber comes from single source: the sap-like fluid produced by the rubber tree, Hevea brasiliensis. This sap-like fluid, latex, contains at least 60 small proteins that can bind to human immunoglobulin E antibody.1 One quarter of these peptides are known human allergens. Humans develop latex allergy when they become sensitized to one or more latex allergens, i.e. the proteins in natural latex. The person’s antibodies mistakenly recognize latex as a “foreign invader” and the immune system mounts a vigorous reaction to “protect itself.” It is unclear why some people develop latex allergy and others do not. Exposure to latex is certainly a factor; people who come into contact with latex more often are greater risk for developing latex allergy. The Centers for Disease Control and Prevention suggests that between 8 to 12% of health-care workers who regularly come in contact with latex become sensitized. This is compared to latex allergy rates of 1 to 6% in the general population. Latex allergy can come from unusual and unexpected sources. For example, people with type I diabetes have developed latex allergy from needles that repeatedly puncture latex rubber-topped insulin bottles.2 Children with congenital abnormalities who spend substantial amounts of time either hospitalized or in close contact with tubing, medical adhesives, and wound dressings have high rates of latex allergy.3 It can be difficult to predict what substances contain latex, so it is all the more important for concerned individuals (e.g. hospital administrators) to seek out “latex-free” products. The symptoms of latex allergy vary from person to person, but also vary in the way contact with latex is made. Since medical gloves, infusion sets, wound dressings, etc. contain latex, skin contact is perhaps most common. People who are sensitive to latex often develop allergic contact dermatitis. Allergic contact dermatitis is a severe skin irritation and immune reaction that occurs when latex touches the skin. Allergic contact dermatitis usually begins with a red, itchy rash that lasts between one to four days. 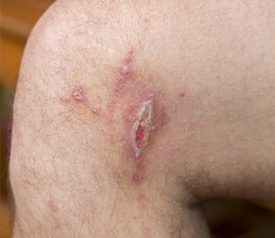 It is also common for people with latex allergy contact dermatitis to develop small blisters over the contacted area. After long-term, repeated exposure to latex, the skin takes on a dry, thickened, crusty appearance. People may also experience allergic contact urticaria, which means they develop hives within 10 to 15 minutes of coming into contact with latex. While most people with latex allergy have only mild to moderate problems, latex allergies are potentially dangerous. The most feared complication of latex allergy is anaphylaxis.5 Anaphylaxis is a severe, life-threatening allergic reaction that can cause low blood pressure, rapid heart rate, wheezing, and swelling of the tongue and throat. If it is not quickly treated, anaphylaxis can be fatal. Because latex allergy is common and potentially dangerous, several professional societies and governmental agencies have adopted latex precautions for healthcare settings. Perhaps most important of these precautions is to use non-latex gloves (e.g. vinyl, nitrile, or polymer) whenever possible. If latex gloves are essential, it is important to use powder-free, reduced-protein latex gloves. Unfortunately, latex gloves are not the only one source of latex in healthcare settings. Another major source of latex is medical adhesives, bandages, and dressings. While healthcare workers can generally avoid prolonged contact with these adhesives, many patients cannot. Thus, when possible, healthcare providers should use latex-free medical adhesives and products. This precaution not only protects patients who have an existing latex allergy, but it also minimizes the risk that people will develop latex allergy in the future. Hy-Tape is a medical-grade vinyl subtrate tape that is completely latex-free. Hy-Tape should be considered the first line tape for any patient with suspected or confirmed latex allergy. Likewise, Hy-Tape should be the first choice for patients who are at particular risk for developing latex allergy (see table).6 Not only is Hy-Tape free of latex, but it offers the perfect balance between tight adherence and easy release. It holds lines and catheters securely in place, but releases easily and cleanly without traumatizing the skin. Hy-Tape is an excellent choice for chronic care tape applications. If you or someone you know has latex allergy or is at risk for developing an allergy to latex, contact us for a free sample of Hy-Tape or to request additional information. 5. Oei HD, Tjiook SB, Chang KC. Anaphylaxis Due to Latex Allergy. Allergy Proc. 1992;13(3):121-122.